The future vision 2014 - 2025 ‘Werk aan de Werf, Laboratorium NDSM-werf’ shows how the community of the NDSM-wharf in Amsterdam Noord, consisting of several generations of the past, the present and the future, can change an area and together can direct the future. 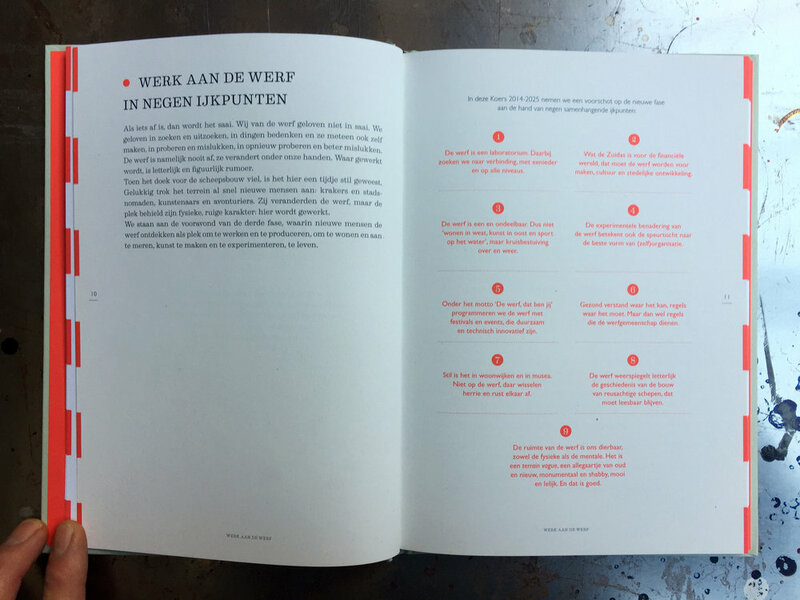 In 2013-2014 ‘Werk aan de Werf, Laboratorium NDSM-werf’ took shape under the name of the 'Self Made Future' initiative, a group of people who are attached to the NDSM-wharf: essayists, shipbuilders, artists, writers, entrepreneurs, employers, employees and policy makers. At ndsm.nl/selfmadefuture another 12.500 people committed to this vision. This publication is based on weekly meetings with NDSM people from all over the yard and beyond. Topics like Kunstenplan, NDSM Island, parking, access West and East, NDSM Waterstad, Werf will be Erf en the identity of the NDSM harvested in addition to discussions nine related key points for the future of the wharf. Foundation NDSM-werf took the initiative for 'Self Made Future' in collaboration with Stadsdeel Amsterdam-Noord and association of entrepreneurs 'De Toekomst'. This historical and at the same time futuristic document is interesting for anyone who wants to know more about experimental urban development, self organization and -programming, and today's spirit of tribal community.